The Eleventh Ring: Bartholomew the Adventurer, Book One is an epic fantasy written by Tom Hoffman. Bartholomew Rabbit had a strange dream about a mysterious figure wearing a green cloak. The stranger's paw emitted a blue glow that wrapped around the sleeping rabbit, and he said that Bartholomew spoke with her in his dreams, though he retained no memories of that. And then the figure released a pink cloud that moved towards him and said, "You must find it. It is yours and you must find it." When Bartholomew woke up, he and his servant Parfello searched high and low for that something from his dream. Bartholomew had no idea what he was searching for; there was only that compulsion to search for it. Parfello suggested that Bartholomew travel to the Cavern of Silence, a magical place where answers could be found -- if the questioner was willing for wait for a response. Bartholomew was intrigued by the concept of adventuring to the Cavern and, armed with a sturdy canvas pack, set off on his quest. Tom Hoffman's epic fantasy, The Eleventh Ring: Bartholomew the Adventurer, Book One, features a most remarkable and introspective rabbit whose journey to the Cavern of Silence is just the beginning of a grand and sometimes terrifying adventure. Hoffman's tale is compelling and thoughtfully plotted. His characters are animals, which I had thought might be a distraction, but they quickly became much more than furry woodland creatures. Along the way, Bartholomew encounters Oliver T. Rabbit, a scientist and inventor, whose gifts with machinery infuse a marvelous steampunk atmosphere to the tale. I had a grand time reading The Eleventh Ring. The visionary questing Bartholomew undertakes brought to mind the classic fantasy tales of George MacDonald, Hope Mirrlees and Lord Dunsany, with more than just a touch of Jules Verne added in. The Eleventh Ring: Bartholomew the Adventurer, Book One is most highly recommended. 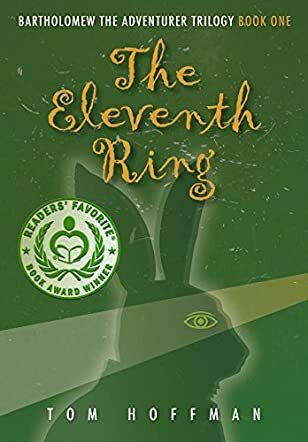 In Tom Hoffman’s book The Eleventh Ring, which is the first book in the Bartholomew the Adventurer trilogy, Bartholomew Rabbit is just an ordinary rabbit living a peaceful, normal life until he realizes that something is missing. He begins to search all around, but the problem is that Bartholomew does not know exactly what is missing ... until his butler, Parfello, suggests he embark on a journey to the Cavern of Silence. Bartholomew, having always liked the idea of being an adventurer, decides to follow the advice of his trusted friend. This leads to an amazing series of adventures with a few unlikely traveling companions, which leads Bartholomew to discover new friends, strange creatures, and worlds unlike his own as he learns that his journey may be about far more than just a lost something. When I first picked up The Eleventh Ring by Tom Hoffman, I wasn’t sure what to expect. When I realized I was in a world of rabbits, I started to get confused. Why rabbits? Why not just people? But as I followed Bartholomew Rabbit on his adventures to strange landmarks and new worlds, I lost all my skepticism. Why not rabbits! The fact is, these rabbits are delightful and thought provoking, and they made me laugh more than once. The story is a bit over the head of my six-year-old as of yet, but I suspect she will thoroughly enjoy Bartholomew and his travels when she is a bit older. I know I certainly did. The Eleventh Ring (Bartholomew the Adventurer, Book 1) by Tom Hoffman is a story about Bartholomew Rabbit, who’s on his sixth day of searching for something that he could only describe as an object that can roll. This makes the search difficult. His servant Parfello recommends that Bartholomew go to the mystical Cavern of Silence – a cavern that can answer questions – and ask the cavern to describe his lost item. Thus begins Bartholomew's exciting quest. It may seem like a children’s book at first, with the title and the cover art, but everyone would be able to enjoy it. Even parents can read it to their kids who are not quite flawless with their reading yet. In what started as a simple search for a lost item, Bartholomew finds more than he expected; an adventure. On the second page of the book, there’s an undated ‘photo’ of author Hoffman and Bartholomew, the protagonist himself. It’s an excellent, witty way to greet readers and enhance the whimsicality of the story from the start. The plot moves at a swift pace and there are plenty of exciting twists and turns. I love how Hoffman weaves in philosophical aspects that adults would love and welcome. The Eleventh Ring is a marvelous read and certainly gets a thumbs up from me. The Eleventh Ring (Bartholomew the Adventurer Book 1) by Tom Hoffman is the first in a trilogy following Bartholomew the rabbit on his adventures. Bartholomew wakes one morning with the strong feeling that he has lost something but he doesn’t know what it is. After a lengthy search, his servant Parfello tells Bartholomew that he must visit the Cave of Silence in order to discover what it is he has lost. Somewhat excited about becoming a real adventurer for the first time, Bartholomew sets off on his travels. After reaching the Cave of Silence, he is directed to the Tree of Eyes and then to the Swamp of Lost Things. It is there that he meets Oliver T. Rabbit, a scientist who works for the Excelsior Electro-Vacuumator Corporation and is searching for the rare Duplonium. This is just the beginning of Bartholomew’s adventures. His childhood friend Clara is in trouble and needs to be saved from Zoran the Emerald Shaper. Bartholomew must undertake his biggest adventure to defeat Zoran who wears the terrible, dreaded Tenth Ring. Can Bartholomew succeed? And what is the connection between Clara and Oliver T. Rabbit? I thoroughly enjoyed The Eleventh Ring (Bartholomew the Adventurer Book 1) by Tom Hoffman. It is a quirky story; on the outside it looks as though it is going to be a Peter Rabbit style tale but it is revealed as much deeper than that. While it seems to be a kid’s story of a rabbit off on his adventures, Tom Hoffman has also very skillfully dealt with a number of “older” issues, such as morality, loyalty and prejudice amongst many other things. It is a delightful tale, full of twists and turns and, just when you think the tale is over, off it goes again on another tangent. The characters are very well developed, each with their own unique characteristics that add to the story. Overall, an excellent book. I really enjoyed it and am looking forward to book 2. Bartholomew is a rabbit with a problem. He’s been looking everywhere for a lost treasure, but that’s a difficult thing to find when he doesn’t know where it is, what it looks like, or even what it could possibly be! Following the advice of his long suffering manservant Parfello, Bartholomew bravely sets out on a quest to find this treasure. Little does he know, this quest will set off a chain of events, filled with magic and friendship, danger and fear, in which his lost treasure will not be the only thing he ends up finding. Such is the tale of The Eleventh Ring, which constitutes Book One of Tom Hoffman’s Bartholomew the Adventurer series. Upon first reading the novel’s description, I was intrigued. I have a soft spot for adventure stories set in fantasy worlds, and an even bigger soft spot for rabbits. Really, how could anyone resist that combination? Thus, I decided to give The Eleventh Ring a go, and am pleased to conclude that it makes for a entertainingly fun and light read! Many little details from the Eleventh Ring pay homage to Tolkien’s The Hobbit. Bartholomew, for example, is quite Bilbo-like in his initial naive pomposity and conflicting feelings about adventure. There is a certain droll humor to the tone of the story, and a few familiar quotes sprinkled in. As a Tolkien fan, it gave me a happy thrill every time I identified one of those parallels, which occurs more frequently in the first few chapters of Hoffman’s novel. As the novel progressed, the story took on a charming originality and complexity of its own. Hoffman keeps the plot twisting and turning, and isn’t afraid to set up gorgeously lush locales (the rich descriptions of islands and caverns, castles and swamps really brought the world to life), introduce thought-provoking concepts (the meshing of technology and magic was interesting, and the unique idea of shaping was good at tying seemingly random events together) and bring in interesting new characters (the eccentric scientist rabbit Oliver is absolutely my favorite!) into this magical world. The constant novelty fired up my imagination and kept me engrossed in the story. All in all, I enjoyed the Eleventh Ring, and recommend it to anyone looking for an adorable read.